When Jesus walked the earth during his brief three and a half year ministry he explained to his closest followers that although the Hebrew prophecies foretell that the Messiah would reign forever, and Jesus was indeed the appointed Messiah, or Christ, he must first ‘go away.’ But later he would return. The disciples did not immediately understand what Jesus was saying. But later they did. Jesus’ going away meant that he intended to return to his original domain in the spirit realm—back to heaven. Indeed, 40 days after his resurrection the apostles of Christ personally witnessed Jesus levitate off the earth and ascend up into the clouds. Of course, Jesus was not physically transported on up into the upper regions of the atmosphere and into outer space. One does not gain access to Jehovah’s domain by traveling through time or space. Unseen to human eyes Jesus entered through the portal that leads to another dimension — a world that is strictly inaccessible to mere earthlings. Besides, Jesus had been put to death as a man. His humanity was forever sacrificed as the required ransom price. His resurrection was as a spirit. But as is possible for spirits/angels, Jesus materialized flesh in order to interact with his disciples. The fact is, at that time the disciples lacked faith and were incapable of accepting Jesus’ resurrection as a spirit. So, it was necessary for Jesus to appear to them in a recognizable human form in order to literally walk them through the fact that he was indeed alive. 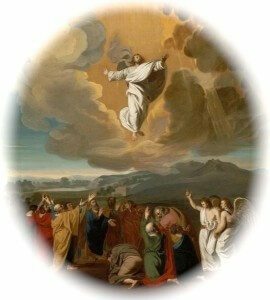 No doubt, though, his post-resurrection, materialized physical body was dissolved as soon as Jesus was out of view of those on the ground, after he ascended into a cloud. In fact, the scripture says that Jesus was received into a cloud out of view. But his visible ascension was accomplished in order to establish the fact that Christ had indeed gone back to the Father. 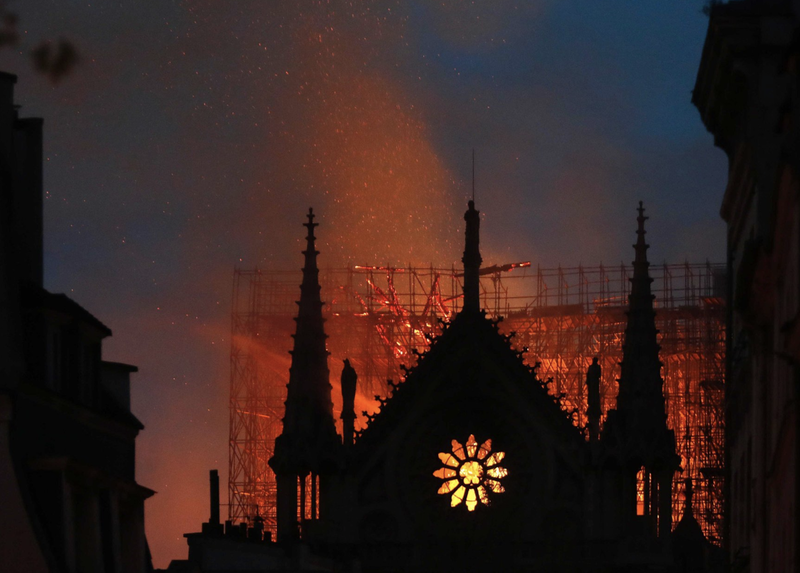 That is why God arranged for so many eyewitnesses to be on hand for the event. Along with the twelve apostles (eleven at that particular time) there were also 500 disciples who saw Jesus after his resurrection, some of whom may have even been on hand for the ascension. These were to form the nucleus of the Christian congregation that would soon develop and they were used by Christ to give testimony to what they had witnessed—the resurrection and ascension of Christ to heaven. At the very moment Jesus’ disciples stood gazing at the amazing spectacle two angels suddenly appeared in their midst — asking the astonished crowd why they were standing there looking up into the heavens when this same Jesus was destined to return just as he had departed. To be clear: What was the manner of the Lord’s departure? Did Jesus go off into the wilderness by himself and simply vanish? No. Did Christ ascend in full public view of unbelievers? Again, no. Prior to his ascension Jesus stood in the midst of his disciples and gave them specific instructions. Then Jesus departed from their company and went up into the sky. If Christ is to return in the same manner that he departed, as the angels testified that he would, then it is reasonable that Jesus would descend from heaven and walk among his disciples once again—to be sure, a visible parousia. That is not to say that Jesus will manifest himself again as a man. After Jesus ascended to the Father he now possesses a glorified spirit body. It is that glorified body that Jesus will manifest to the chosen ones. Interestingly, the 500 disciples who saw Jesus after his resurrection and those who witnessed Christ’s ascension, were not even at that time anointed. The anointing spirit was not poured out until ten days after Christ had ascended back to the Father. Likewise, the man Saul, a Pharisee at the time, who later became the apostle Paul, was the only man to see a post-ascension manifestation of Christ, which is why Paul later explained that he was like a man born premature. In what sense was Paul born prematurely? Whereas the 500 saw a human-appearing Christ, Paul saw a glimpse of the Christ that will manifest himself to his earthly disciples during the parousia—a glorious manifestation it will be. Just as the apostles were not anointed when they witnessed Christ ascend into the heavens, neither was Saul anointed when he was blinded by the supernatural manifestation of Christ on the road to Damascus. What is the significance of this? First, it does not signify that Jesus will manifest himself to non-anointed persons during the parousia. The significance of the fact that Jesus appeared to non-anointed persons in the first century is that it serves as a portent. A portent of what? A portent of the fact that anointed persons who experience the manifestation of Christ will be transformed into the very image of the Son of God. It will be the consummation of the anointing. Just as Saul and the 500 were anointed shortly after they saw Jesus, as he manifested himself from the spirit realm, so too, the chosen ones who are on hand during the parousia will then receive the full measure of Jehovah’s holy spirit. That is something that no human (other than Christ) has ever before experienced. This is what is foretold in the 2nd chapter of Joel, as well as other Hebrew prophecies, regarding God’s spirit being poured out upon the sons and daughters of God during the last days. Jesus likened his presence (parousia) to the lightning that casts its light across the entire sky. What did Jesus mean by that? The comparison of Jesus’ presence to literal bolts of electrons firing up the sky with light would seem to indicate that, unlike his post-resurrection appearances, Jesus’ presence will not be in some earthly location. That is why Jesus cautioned his followers to categorically dismiss any and all proclamations that the Christ is here, in the wilderness; or there, in the inner chambers. Just as a streak of lightning can be seen for many, many miles by persons widely separated by great distance, in that same manner, Jesus is now in the position to instantaneously reveal himself, in a flash, from the invisible realm, to all of God’s chosen ones scattered all over the globe. Such a manifestation is certain to have a transformative effect upon the beholders of it.